Monday UPDATE: As was mentioned back on Friday, this was set to be a squirrelly weekend at the box office and it seems that forecast proved to be ridiculously quite accurate. We have two films claiming the top spot and neither of them star the speaking-to-an-empty-stool octogenarian. While End of Watch and The House at the End of the Street outperformed (the former more than the latter), Eastwood underperformed but not as poorly as that Dredd character. Ouch. And then there's The Master, sneaking into seventh on just 788 screens, with a $6300 per theater average. Oscar has its front-runner. Getting a read on this weekend is akin to attempting to make contact with a Steven Strasburg fastball. After a lengthy run of weaker-than-expected results at the box office, Hollywood has offered up something for everyone this weekend - there's not a demo unaccounted for. But based on the blase attitude exhibited by moviegoers over the past month, will the litany of quality options make a difference? 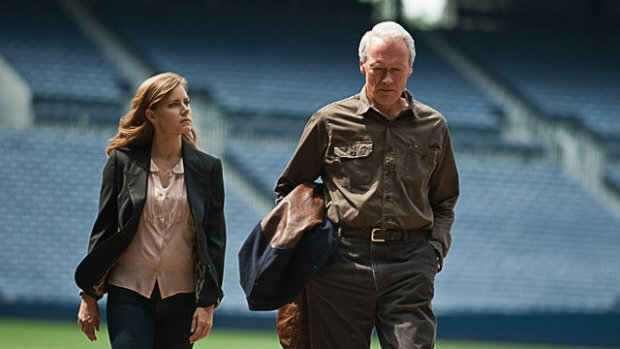 Trouble with the Curve ($15M) - Fresh off his rambling rant to an empty stool, Eastwood returns to the big screen for the first time in four years with a baseball dramedy squarely targeting the older female demographic. Will Eastwood's RNC appearance bump up the take? Dredd 3D ($14M) - How volatile is the ultra-violent spectacle? I can see the thing banking anywhere from $10M up to $25M opening weekend. Holding to the lower end of that range but don't be shocked if it ends up topping the list. House at the End of the Street ($11M) - If not for Katniss Everdeen Jennifer Lawrence, this not-screened-for-critics wannabe fright fest would be DOA. Finding Nemo 3D ($10M) - While Nemo was no Simba, it's straight cash homey for the Mouse House just the same. End of Watch ($9M) - Another film that could very well surpass my estimate. Hard to peg this cop drama but Jake Gyllenhaal hasn't yet proven to be a bankable movie star. Also: The Master - After raking the largest per theater average ever, the Paul Thomas Anderson masterpiece goes wider with around 800 sites as the Oscar buzz buoys more bombastic numbers.